Currently, academic researchers in science, technology, engineering, and maths (the STEM subjects) face a life of fierce competition for grants from a limited budget resulting in anxiety about career progression. This happens despite the recognition that investing in STEM research is beneficial for the UK’s economy and world standing as a ‘science superpower’. Adding to career anxiety is that sometimes, even the most well-laid plans can get disrupted by ‘life’ – unplanned events such as ill health, or a loved one requiring care, which can require a career break for men or women. Additionally, many women still have to make a choice between starting a family and having a career. Evidence from the Women in Scientific Careers report shows continued underrepresentation of women at professorial level and in certain subjects, despite a number of initiatives to improve diversity. A number of reasons contribute to these statistics that lead to the ‘leaky pipeline‘, but one of them is that women are still often the primary childcare provider (although the number of stay-at-home fathers is increasing). The outlook definitely is not bleak though – more people now appreciate that supporting individuals to reduce the impact of career breaks benefits STEM as a whole. Professor Daphne Jackson, the UK’s first female physics professor, pioneered practical measures to support those who take a career break to remove barriers to pursuing careers in research. She observed many talented researchers taking low-level jobs following a career break because they needed retraining to return to the workplace. Jackson launched a scheme in 1986 to help individuals return to their careers after taking a break to have a family, caring for relatives, illness, or because of their partner’s relocation. The scheme incorporated time for refreshing, or learning new, technical skills, and allowed flexible working to accommodate family or caring responsibilities. The Daphne Jackson Trust was set up in 1992 after Jackson’s untimely death and has supported over 290 individuals return to a research career. The Trust launched a survey earlier this year to explore quantitative and qualitative effects Daphne Jackson Fellowships had on individuals, the research knowledge base, and capacity-building within STEM. Seventy-nine percent (160) of contactable former Fellows responded, and the report ‘Leading the way for returners‘ contains details about the overwhelmingly positive results about Fellows experiences, also summarised in an infographic. Over 70% of Fellows remained in research-based roles 2 years post-Fellowship, and 57% for up to 5 years post-Fellowship. When including roles affiliated with STEM along with research roles, the percentage increases to 90% working in STEM for the majority of their careers post-Fellowship. Ninety percent of former Fellows also said that the Fellowship helped in securing subsequent jobs because they had evidence of funding success, recent experience of working in research, and opportunities to network. And 72% said they are now in their first choice career. Integral to the Trust’s work are the huge number of supporting organisations, which is testament to confidence in the Trust’s approach and the changing attitudes towards career breaks. Many funding organisations and learned and professional bodies are now recognising that researchers do not fit into a mould – researchers are individuals and earlier selection criteria may now be outdated as we recognise the value of diversity. Former Fellows also experienced many beneficial effects to personal development, such as 96% said it improved confidence, 88% said it helped with job satisfaction, and 76% said it helped their independence. Qualitative answers revealed that former Fellows appreciated the individually tailored support from the Trust. So, the evidence is there – using a supportive approach that accounts for individual circumstances, and appreciates that career breaks can lead to a lack of confidence, can lead to successful outcomes. 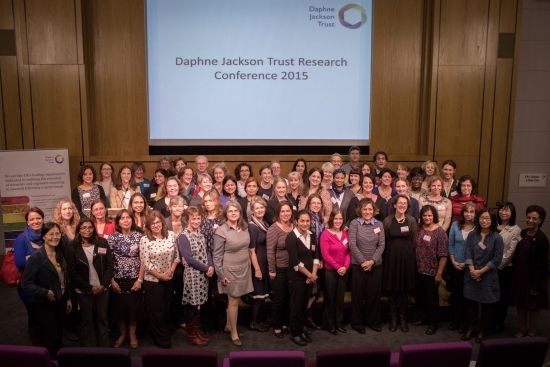 Retaining talented researchers is important for progressing our knowledge and it makes economic sense too – we can still get returns on the investment of funds in training researchers, and the Daphne Jackson Trust shows that the model works. The Royal Society of Biology has established the Returners to Bioscience Group to examine experiences of those who face difficulties in returning to a career in the biosciences as well as those who achieve success, and is celebrating the first ‘Returners to Bioscience Week‘ from 9-13th Novembers 2015. Join the conversation on social media with #BioReturners. Read more on our blog: ‘Returners to Bioscience – a neglected pool of talented workers‘.